Anish Giri felt Fabiano was already in blitz mode and therefore quickly played 4…0-0 without pausing to seriously consider 4…Bxc3. Then after 5.Nge2 he slowed down dramatically, but the position after 5…c6 6.Bg2 a6 was already extremely unpleasant for Black. Fabi soon ended up with a crippled pawn structure, before the first moment of truth came after 19.Rcd1! The pin down the d-file is threatening to be lethal, and here Caruana took over 5 minutes to pick the wrong option. He needed to go for the ugly 19…Nb7, stopping a piece landing on c5 at all costs, since after 19…Nb5? 20.Nc5! Rxb2 21.Nxe6 Black’s position was in ruins. It looked as though Magnus was about to pull off a smooth victory. It was clear Magnus sensed the importance of this moment, since he thought for over 9 minutes, surrendering his lead on the clock. That gave time for computers and grandmasters to spot a subtle option for White. 24.Rxd4! Kf7 25.Kh1!! was surprisingly crushing. The point is that the king steps out of Black’s one idea: that 25.Red1? runs into 25…Ne5! 26.Rxd8 Nxf3+! and Black saves the day with perpetual check. Grischuk noted that if Magnus found such an idea it would be evidence that he was in good form and thinking clearly. From there Magnus calmly went on to prove that White was winning, and finally the dam had burst! I feel that Game 1 was critical for the match. It was very tense and it was the breakthrough for me, and then in the second game I wasn’t so sure about my position, but after I’d won the first one I felt very calm. Although Magnus now only needed draws he stuck to his guns and played the Sveshnikov Sicilian, showing a new idea on move 11. Fabiano didn’t blink, though, and it looked like just the kind of position he needed, at least until he pushed 21.c5!? I had a very bad start, unfortunately, especially in the second game, but I wasn’t playing my best chess today and Magnus I think played very well. If Fabiano makes a comeback it will probably be the greatest comeback in chess history and on the level of Liverpool's comeback against Milan in the Champions League final. He wants 3:0. This will be an excuse for the 12th game - an excuse he doesn't really owe. So Magnus had won the tiebreaks even more convincingly than in New York and will now have stretched his reign to 7 years by the time he next defends his title in 2020. 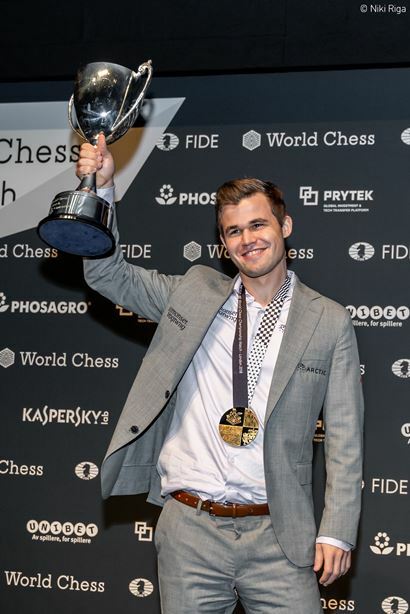 Garry Kasparov's comments on Carlsen’s rapid skills echoed those of Alexander Grischuk, who had wondered on our live show if Magnus actually has a “negative gap” in quality between his rapid and classical skills – i.e. that he plays better in speed chess! 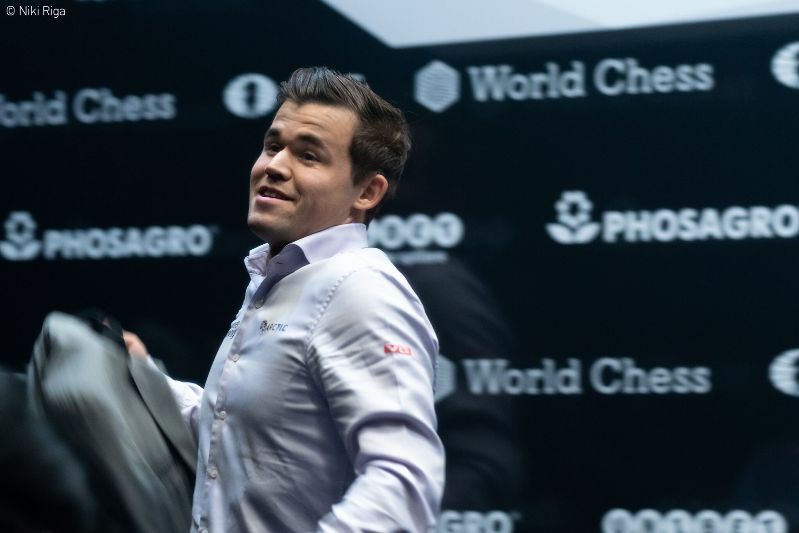 Nevertheless, Garry had led the criticism of the draw Magnus made in Game 12, and wondered aloud if Magnus would be the favourite at all since his nerves seemed to be failing him. The World Champion took the chance to hit back in the press conference! The match went the distance because of very tough defence by both players in tough positions, and it just shows you how difficult it is to win games at this level. It was not for the want of trying - except in the 12th game, when it was exactly for the lack of trying! - but at that point I made a sort of decision that I felt very comfortable with at the time and I would have believed to be the right one regardless of the result in the last game. It’s very special for me to win this time. I feel that Fabiano was the strongest opponent I’ve played so far in a World Championship match. In classical chess he has just as much right as I do at this point to call himself the best in the world. I’m very happy to have overcome this great challenge and I’ll continue to work to get better in two years. He deserves to be World Champion and he deserved to win this match. We both had weak moments, but on the final day, the tensest day, he showed good chess and I didn’t. So of course he deserved to win. Obviously I’m very happy with the way the match ended, but I don’t think we’ve seen the last from Fabiano in this particular context. We hope you enjoyed the ride!